I learned long ago that it pays to plan ahead before I hit the water for a day of fishing. Knowing the tides, watching the weather, and reading the fishing blogs for the latest intelligence can make all the difference. Similarly, my time at the National Oceanic and Atmospheric Administration (NOAA) and on Capitol Hill taught me that planning ahead and being proactive pays off when it comes to managing our nation's fisheries. The Pacific Fishery Management Council could get ahead of the curve in September, when it will weigh the fate of forage fish that nourish the big fish that many of us love to catch and eat. As I've discussed previously, these types of small fish, such as sardines and anchovies, serve as an essential source of nourishment for larger fish, including the wild salmon and tuna that are popular with anglers, chefs, and consumers. Forage fish also are consumed by other wildlife, from whales to seabirds, making them a vital part of the marine food web. When you're out on the water, timing is critical. Subtle fluctuations in the weather or tides can change where fish are located. That's why I take time to research and plan upfront. This allows me to act quickly when I see the prospect of a great day of fishing. 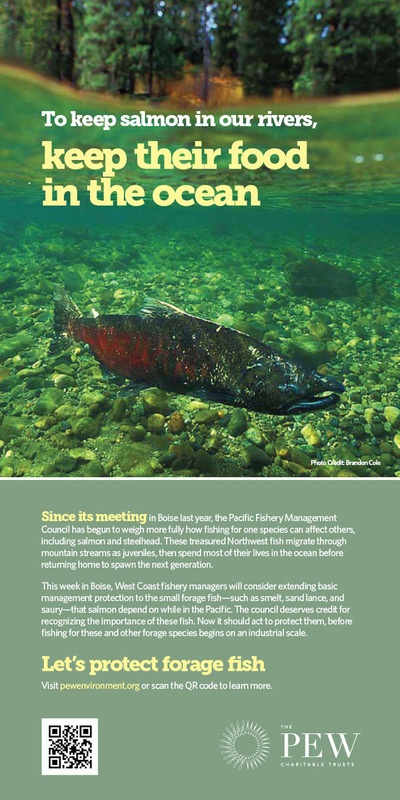 Just as fishermen wouldn't leave the dock unprepared, the Pacific council can ensure that plenty of forage fish are left in the water to sustain thriving marine ecosystems. That's why I hope it won't let this opportunity get away.